Luksus ferie stranden villa ligger i en privat tropisk blomst og kokos treet hagen til Coconut Laguna stranden foran Resort, 40 meter fra den vakre Bang Por tropisk og hvit sandstrand, og 20 meter fra det krystallklare vannet svømmebasseng med vask for barn og et boblebad. Bygget til høy vestlig standard med en thailandsk design innflytelse, er denne siste (2010) ferievilla en romslig innkvartering for 4 gjester i to (2) romslige dronning soverom hver utstyrt med satellitt-40 "TV, DVD og eget bad, en komfortabel stue med satellitt-52 "TV og surround sound system, et fullt utstyrt vestlig granitt åpen kjøkkenløsning. Den enorme dekket utendørs oppholdsrom er utstyrt med stort bord for 8, og sofaer for å spise "al fresco" og avslapping. På den øvre terrassen, vil du nyte jacuzzi for to personer, sunbaths og fantastisk utsikt over solnedgangen. Vifter og aircondition i alle oppholdsrom inne, gratis trådløst internett, gratis lokale telefon, internasjonale TV-kanaler, 24 t / 7d bevoktet resort, basseng og hage daglig vedlikehold, house rengjøring felles området hver dag, i full med sengetøy og håndklær erstatning to ganger i uken, kajakker, er en del av fasilitetene som er inkludert for din komfort. Airport pick-up service, bil eller sykkel utleie, ekstra stuepike, matlaging service, baby seng og stol, osv ... kan ordnes på forespørsel av vår lokale representant. På ferie anlegget Coconut Laguna er det alt sammen bare 11 ferievillaer. To villaene er bygget i typisk tre thailandsk stil, og de andre villaene er bygget av murstein. Et svømmebasseng nådegaver midten av feriestedet, omgitt av palmetrær og prydbusker, noe briljant blomst gjennom hele året. Svømmebassenget, med sitt krystallklare vann, har også et eget basseng for barn, et boblebad og en havutsikt som postkort er laget av. Stranden i Bang Por er 3. 5kms lange, luring den besøkende, og ferie leietaker, for å ta en spasertur og utforske strendene. Denne sandstranden er unik på Koh Samui, og er heller ikke overfylt med mange beachcombers og vandrende turister eller beach-leverandører. Du vil finne, men noen av øyas beste thairestauranter innen gangavstand. Om natten, under visse årstider, en armada av fiskebåter lyse opp horisonter over Gulf of Thailand, som de søker etter blekksprut, krabbe og andre delikatesser for ditt spisebord. Forestill deg å stå på kanten av oase av Coconut Laguna Beach Resort, med de sørlige himmel og de nordlige utsikt over Asia din alene for å verne. Flott, fersk sjømat restauranter på stranden og mini supermarked innen gangavstand fra Villa. For hvert soverom: Dobbel vask, glass dusjkabinett, og WC på hvert bad Uavhengig WC med vask på stue og kjøkkengulvet. Vifter og aircondition i alle oppholdsrom inne, gratis trådløs Internett-tilgang, gratis lokale telefon, internasjonale TV-kanaler, 24 t / 7d bevoktet resort, basseng og hage daglig vedlikehold, Husrengjøring felles området hver dag og i full med utskifting av sengetøy og håndklær to ganger i uken, kajakker, er en del av anleggene inkludert for din komfort. Ekstra hushjelp, matlaging service, barnevakt, osv ... kan ordnes på forespørsel av vår lokale representant. The location and all the amenities were perfect. The pool was lovely, the beach and morning sunrises were fantastic! Our family loved it and were made very welcome. Really glad we've made a great holiday for both you and your family. Hope to see all of you back again soon! So we stayed at Villa Palm for three weeks, and it was awesome. The house is located in a very calm area, not many people on the beach and that's nice. I had very good comunication with Rachel the whole time, both before the trip and while we were there. My hat off to Jenny who helped us with everything we needed. We will definitely come back again. Thank you again Johan for staying with us and taking the time to write us a review. Really looking forward to having you both back again next year! The owner was always responsive to our communications, from our initial email and throughout our stay. The Villa is 2 bedrooms upstairs, each with their own bath. There is also a half bath downstairs. There are A/C units in each bedroom and in the living area. The kitchen has all of the appliances and items necessary to prepare meals, and there is a dishwasher for cleanup. The unit has a washing machine but clothes will have to be dried outside. ( was not a problem). There is a laundry service available. They come to clean the living room and kitchen every day, and the entire apartment is cleaned every 3 days( clean towels and change of sheets) There are Tv's in each room with cable, however, English channels are limited. There are enough for the short time you will be in the Villa . We had a couple of maintenance issues with Washing machine and dish washer, however, the people at the office took care of them all very quickly. If you don't rent a car, you can get transportation by taxi ( using an app called "navigo" - it works in all of Thailand. There are vans for hire that will take you places and wait, the most reliable and reasonable one that we found was Mr Phimol Pongruea (Kamol). When you don’t want to go out to eat or cook, there is a small restaurant(Local, not fancy) across the street for a dinner and they will bring it to the villa if you go order. Right behind is a Bakery- that has rolls and will make a pizza for you which is good. There is a restaurant within walking distance, if you want more choices, at "The Sea" hotel about 1 KM to the left as you come to the Main Street when exiting the Villa. There are many great restaurants on Koh Samui but try Hemingway's on the Beach, and take their cooking class From Jaa. It is on the south side of the island at Thong Krut . We definitely recommend this Villa and would absolutely stay again. We stayed at the villa with our 3 teenage boys for 16 nights. The villa is absolutely stunning , spacious & very clean. The villa is cleaned daily & every 3 days with bedding & towel changes inc beach towels. The onsite office helps with anything you may need , taxis , trips etc. The area is just lovely , its away from the throng of Cherwang & Liami , there are some wonderful beachside restaurants a short walk away either up the beach or the road. The 5 of us regularly ate out for around £40 total , inc a few rounds of drinks and plenty of food with priceless views of the sun sets. There is a Family Mart & 7/11 within walking distance too. The villa is an oasis of calm, we used the communal pool everyday and met and made friends with other families that were staying in the other villas , its total safe & there are staff around all of the day. The Beach is only a stones throw from the villa , its stunning ! Its not a great swimming beach as its quite rocky & shallow in parts but the boys loved to snorkel to see the fishes and they used the kayaks too. Just a few mins walk either side of the villa you'll find wonderful Thai massage huts which is the best way to spend a relaxing hour in the heat listening to the waves on the beach !! BLISS ! Its also a great base for exploring the island , we hired a car for 10 days and saw lots & had some wonderful experiences ...the highlight was visiting the Samui Elephant Sanctuary, PLEASE PLEASE stay away from the elephant trekking that still goes on on the island ... visit them in a happy place where they are loved and cared for. Thank you Rachel for your wonderful booking communications & for arranging airport collection which was waiting on our arrival. I have nothing but positive feedback for not only the villa but the area of Bang Por & Koh Samui ... we have the most wonderful holiday. It is so wonderful to hear about the great time you and your family have spent with us as well as of the island, and this makes us really happy too! You have been so kind and communications with you have been so easy too, we really hope that you will visit us again! Nice villa, very specious and with all the facilities you need for a stay. Couple of minor issues when there - door and leak issue but all resolved very promptly. Do leave some time to arrange any taxi pick up etc as we did find it hard to make local contact on occasions - phone ringing out and no one at the office. Thank you very much for your review and feedback which we value from all our guests. The communication may have been delayed due to the overwhelming occupancy in our resort during this time of the year, but we always strive to give the best service. I have since passed on your comment to our team and we have taken note of this point. We hope you had a nice vacation on the island and hope to see you back again. Another unforgettable stay to remember! When I first visited Koh Samui in 2015, It was my maiden trip with my then girlfriend (now wife)! We stayed at the Coconut Laguna Villas for 5 nights back then and we had such a splendid time. The owners were very quick to respond, very friendly and helpful to share the activities around their vicinities. 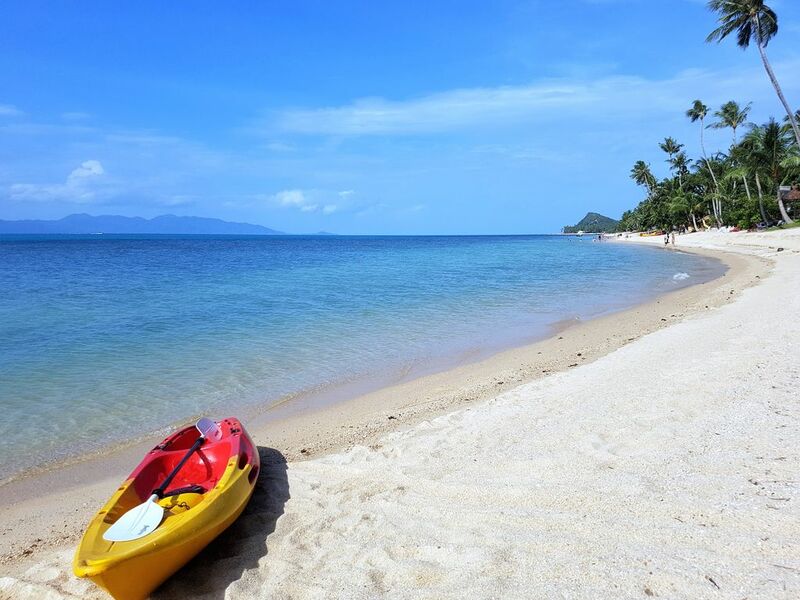 We decided to revisit Koh Samui again this year and did not have to think twice to return to stay there. The villa was very well maintained, clean , it also had a lovely patio to gather for wine and drinks with friends (we loved this area), a nice outdoor dining table, fully air conditioned interior and a fully equipped kitchen. They had 2 fully furnished rooms upstairs which had bathrooms attached and a huge area outside the rooms with a Jacuzzi tube and sun tanning beds. There is a big pool less than a minute walk away and the famous clear blue sea of Samui is probably another 30 secs away. Location wise, I really like how tranquil the area is. It is very quiet and peaceful but yet it is only minutes drive away from the many good restaurants and bars surrounding it. Fisherman's village will be about 15 mins drive/bike ride away. The villa also provided us with options from food delivery to car/bike rentals to booking of tourist attractions. We were extremely happy we came back to stay and believe we will make this our permanent Samui choice from now! Thank you for the wonderful experience yet again! It is such a pleasure having a returning guest and we hope that we will be seeing you again in Samui. Den fantastiske Bang Por Beach ligger på nordsiden av Koh Samui Island. Dette området byr på et rolig tilfluktssted, fantastisk utsikt over Koh Phangan, og snorkling på mindre enn 100 meter fra stranden over Coral barriere. Bang Por er 5 minutter unna Nathon hovedstaden byen eller fra Maenam og Santiburi mesterskapet golfbanen på den andre siden, ti minutter fra Bophut - Fiskere Village eksotiske butikk hus, mange barer og restauranter langs kysten. Området er ikke så overfylt som Chaweng og Lamai, men hvis du ønsker maksimal action, er det bare 20 og 30 minutter unna. DISCOUNT 10% discount on the weekly rate for 2 weeks rental or more. Extended stay rates are available upon request. ELECTRICAL INCLUDED Free electrical (up to 300 Kwh per week) & water consumption. Any amount above the free electrical usage is charged at 10 Baht per Kwh before check-out. CANCELLATION POLICY 1. Up to 60 days before arrival - the initial 25% reservation fee will be retained by owner and the remaining 75% that has already been paid to owner (if any) will be refunded to guests. 2. Less than 60 days before arrival - the entire rental fee is due and no refund will be made.